Are you trying to promote your blog content in places where it’s not appropriate to do so? This only results in bad business for your blog. Social media marketing is all about getting your content out there—into the hands (onto the screens) of your followers, your fans, and your customers. But that doesn’t mean that all social media sites are created equal. It also means that you shouldn’t treat your different audiences the same. At the heart of your social media strategy is likely your blog. And for good reason—blogs provide fresh content for your site in a very neat package, which you can then hand deliver to your social profiles. But that doesn’t mean that your blog content is appropriate for all of your social profiles. Facebook, Twitter, and Google+ are great for blog content social sharing. But I want to highlight three sites where I believe blog content isn’t appropriate: LinkedIn, Reddit, and Digg. While these sites are often used for this very purpose, their real lot in life is not for the self-promotion that blogs provide. If you’re a business owner and you haven’t set up a page on LinkedIn, shame on you. This place is an excellent source for leads and networking—if you use it correctly. Your business page should be used to share information about your business. New job openings, award announcements, profiles on your company, and general “why should you work for us?” posts are all excellent content. However, thinking that your industry blog, as amazing as it might be, is appropriate for your business page is misguided. The whole point of LinkedIn is to try and connect to people and companies for networking purposes. Generally, when someone follows your company page, they’re hoping to stay abreast of company news, your new products, or your open positions. People who are interested in your blog content will easily find it by liking your Facebook page or by following you on Twitter, which are two places where your blog content will absolutely resonate. So who’s doing it right? Try Nike or the the Home Depot for some great examples. Don’t get me wrong—you’re welcome to share things that you find relevant or interesting, including the blog posts you’re proud of, on your personal LinkedIn profile. But your personal interests and the interests of your business should always be kept separate and distinct. Unless your blog is filled with cat pictures, accurate memes, or really awesome/weird/strange/interesting videos, you’re probably not going to cut it on Reddit. Sorry. In general, redditors detest blog spam. 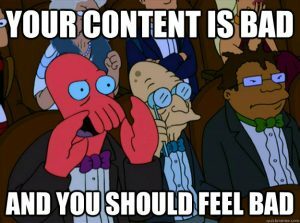 Most subreddits have stipulations in their rules about posting your own blogs (a.k.a., don’t do it), and the site’s spam filters are amazingly adept at stopping advertisers and marketers who think they’re being ninjas cold in their tracks. Too many attempts at posting your content generally ends in what’s called a “shadow ban,” where you can still see and interact with the site, but your content will never appear, no matter its relevancy. And if you think that you can just create as many spammy accounts as you want, think again. IP bans can and do get placed on multiple offenders. Reddit is for sharing relevant news that, in general, resonates with young Internet users. If you’re a plumber, your content probably isn’t going to capture the attentions of the demographics of the site (or get through the spam filters, for that matter). If you really do want to get plugged into Reddit’s over 3 million unique users, try their ads (though, they usually get quite a few downvotes—Redditors don’t like ads, either). You could also join the site and jump into some relevant conversations; there’s practically a subreddit for any topic/industry out there. But in general, you shouldn’t toot your own horn on this site. It’s considered very bad form and will most likely get your post downvoted and therefore not seen (that is, if you can get by the spam filters first—good luck). You can submit as many links to Digg as your heart desires, but unless it’s breaking news, it doesn’t stand a chance at making the first page (which is the only page). And, contrary to popular belief, submitting a link multiple times does NOT convince Digg that it’s awesome. Can your content really compete against North Korea, Google Glass, and Bitcoin? I highly doubt it. Instead, you should be using Digg to find relevant news items that you can then share with your other social media followers. The more interesting content you provide and point to on Facebook, Twitter, and Google+, the more people are going to look to you and your business as a resource. Okays, sometimes you write a jaw-droppingly awesome piece and just have to submit it. That’s cool, if it’s the exception and it really adds to the community. But please don’t just post your own stuff (if it’s good, then other people will find and submit it). Besides, we’d love to see and share what you’re finding interesting. Most of the time it’s not our own stuff. By all means, be confident in the work you’re producing for your company. Shout out your good works as loudly and as often as you deem appropriate. Just remember where you’re posting and who your audience is and tailor your content accordingly. And, if your content is truly amazing, the social media marketing will happen for you—no need to self-promote. Leave that for your Twitter and Facebook accounts.